It’s fun to frolic in the sun, especially when you’re young, and get a tan and some vitamin D in the process. I did it at Muscle Beach in Santa Monica when I was in my teens and twenties. But enough is enough even though some nutrition gurus are still pushing sun exposure as a healthful experience. Probably fifteen or twenty minutes in the sun is a healthful experience; over that amount of time, though, and your skin cells will suffer. Take a good look at these photos of a 69-year-old truck driver. 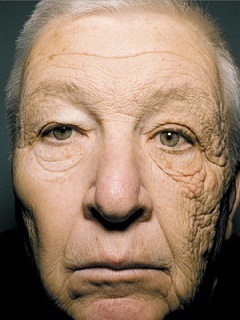 He worked as a trucker for 28 years getting a lot of sunlight on the left side of his face. As he drove many hours each day he got chronic exposure to the UVA and UVB rays of the sun through the left window of his truck. His case was written up in the New England Journal of Medicine. Physical examination showed that the left side of his face had a thickening of the epidermis, destruction of elastic fibers, and prematurely advanced wrinkling. 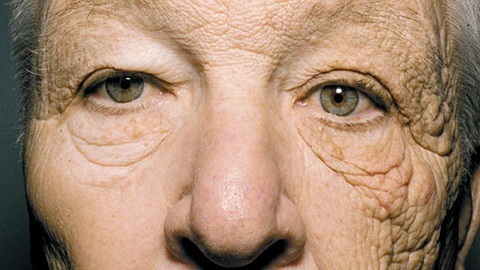 The left side of his face looks at least twenty years older than the right side of his face. Look at another photo for a close-up of what damage the sun can do. A good tan when you’re a teenager looks neat. But I’ve seen what happens to the skins of beach people as they get older. Their skins do not look so neat as they reach forty and beyond. The damage has been done. The glamour days are over.